For decades, Republicans have preached they’re “Pro-Family,” espousing traditional marriage as best. Emboldened by studies showing children fare best in intact families, and fearing the religious right, the message was simple: Marriage is best, so get married and stay married. But those interested in public policy know, positions need to withstand three tests: they should be reviewed for effectiveness, be comprehensive and stand up to rigorous critique. Republican policy fails all three. The effectiveness of Republicans position can be examined using U.S. Census data. 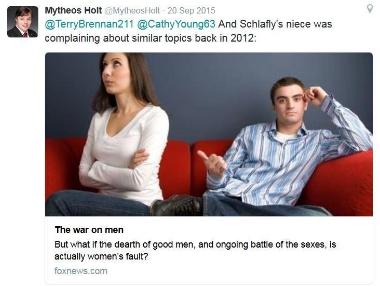 In another article published by The Federalist, Brad Wilcox wrote “The Divorce Revolution Has Bred An Army Of Woman Haters.” In it Wilcox lumped strong groups of intelligent, credentialed, well studied, articulate, child advocates working state capitals, with others having a nom de plume I’d not mention or respond to. Branding the child advocates with the labels mentioned in Wilcox’s article is simply not helpful in enacting the best policy for children. To his credit, Wilcox acknowledged he knows more about marriage than how divorce impacts citizens and said he’d write more “later in 2016.” Sorry Brad, kids can’t wait. How Pervasive is Fatherlessness, What Can be Done, and Are Conservatives Working on It? Legally, Loftis is right to target “court created Fatherlessness” and the solution is simple. Shared parenting after divorce is best for children, has the endorsement of 110 world experts, is supported by 43 peer reviewed papers, is favored by 70 percent of the population and was the conclusion of the largest study on children of divorce. Even the Council of Italian Bishops endorses shared parenting as best for children and society. Shared parenting is children spending a minimum of 35 percent of their time with each parent which is required for a child to even have a chance to bond with a parent. 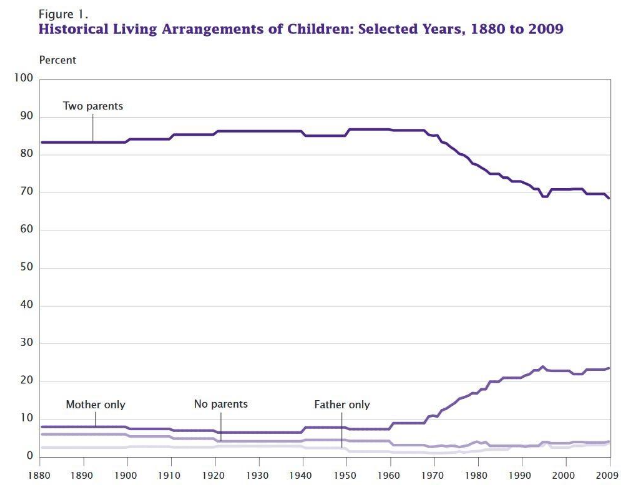 Children receive additional benefits as timesharing increases up to and including 50/50. As shared parenting isn’t suitable for every family, proposed legislation maintains judicial discretion to deal with circumstances like abuse, neglect, or abandonment. There was hope in Florida as a shared parenting bill passed the legislature. The establishment, known as the Florida Bar Association, reacted, spending $105,000 on “emergency Lobbyists” to obtain a veto. Bar associations promote policies for their attorney membership and they don’t like shared parenting. Why? In voicing support for the Florida bill Catherine Real, an attorney with 38 years’ experience explained, “This will reduce the amount of litigation because of the presumption fathers are going to have equal timesharing with their children.” Less litigation means fewer billable hours, so the Florida Bar acted like a special interest group, suggesting messages to the Governor from non-attorneys would be best, so they should write from their private email addresses to hide their profession. Instead of following the recommendation of leading researchers, Republican Governor Scott’s veto sided with the Florida Bar and feminists, including N.O.W., whose spokeswoman said, “What did the father do? He contributed his sperm.” Scott also admitted his daughter was divorcing, but had “no comment” if it was his daughter living in Florida. Is this indicative of conservatives working on child custody reform? Downplaying a reprimand at his state convention, Senator Ben Sasse stated Nebraska is “a well run state.” A ten year study concluded, “Noncustodial parents in Nebraska get an average of five days per month with their children.” The Nebraska Bar Association was sued for lobbying against shared parenting, resulting in its dues being halved, the elimination of staff, and sublet of office space. Judges then began lobbying the Republican legislature, a breach of Constitutional separation of powers, prompting an unprecedented rebuke in the state’s largest paper. Is this suggestive of a well run judicial branch, or emblematic of a legislature doing right by children? 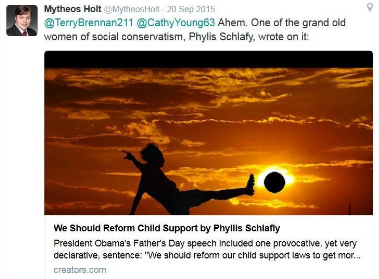 Further, is this indicative of conservatives working on child custody reform? Fathers facing sexist bigotry in family courts is anything but unknown. The public knows it. In 2015, a National Center for State Courts poll found the public believes top groups facing discrimination in courts are the poor, African Americans, and divorced fathers. Republicans would be better served if they changed their ways; rather than preach, listen. Listen to divorced fathers about bigotry in Republican courts. Only then can they rebuild a party which sides with the people rather than the establishment.